A wedding ceremony, like any other social event, can be accessible to visually impaired people. Details of the place, as well as of the ceremony and the party, information about the ritual, decoration, bride´s dress, groom´s tuxedo, bride´s maid and best man´s outfits, all this visual information can be translated into words. Snyder in his article “Audio Description for all” (2004) points to the relevance of audio description in social events, such as weddings and funerals, what contributes to contextualize, inform and include visually impaired people, that depend on friends that accompany them to keep them informed. 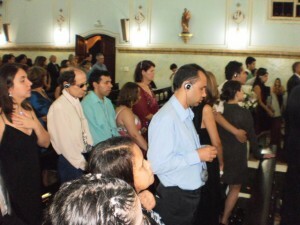 I started to think about the possibility of including audio description in a wedding ceremony in 2009, during the 1st Audio Description Course that I taught at Laramara – Brazilian Association of Assistance to the Visually Impaired People, which was attended by William and Adriana. He has low vision and works as an IT teacher, she is blind and works as a pedagogue at the Technical Center. I want to mention the importance of having people with visual impairment in such courses so that they can take part in audio description work groups as proofreaders and consultants. I cite here the works done by Prof. Dr. Francisco Lima, teacher of audio description courses at Federal University of Pernambuco State and Iracema Vilaronga who takes part at the Tramad group coordinated by Prof. Dr. Eliana Franco, from Federal University of Bahia, both Francisco and Iracema visually impaired people. William and Adriana were beginning to plan their wedding ceremony at that time and asked me about the possibility of having it audio described. Since I had already read Snyder and Benecke´s texts mentioning that AD can be taken to social events, I assured them that it could be done at their wedding and said it would be a pleasure to do it. In October 2010, I started to plan the AD for their wedding ceremony. The first step was to think about what kind of equipment would be used: an equipment that would have sound quality and also would offer mobility around the place. Besides, there was the worry about the size of the earphones that could not be shown. I chose, then, a tour guide system used for guided visitors in museums and factories with portable transmitter and FM receptors. Each guest with visual impairment received a receptor with earphones and the bride and groom wore tiny intra-phone headset. Once the equipment was decided, it was time to think about the script. What could be done beforehand? What information could be gathered? What is possible to be anticipated? We know that in many live events such as congress and seminars, for example, it is hard to get enough information to create a script. However it is possible to anticipate some points that will be essential to offer the audio describer confidence, precision and fluidity to his work. On a Sunday Morning I went to the Chapel Sant’Ana at Instituto Padre Chico. I watched the service and spent some time there observing and taking notes of each architecture detail, the location of the confessionals, the statutes, doors and windows. I have to say that I felt some difficulty to recognize some statues of saints. Then I asked for help to a Nun that was there. Besides these precious information, she also reprimand me for not knowing about these religious charaters. What else could I have done beforehand? Together with the bride and groom, I went to the place for the reception: The Palacete, a mansion in the classical style, built in the 19th century and listed as a historical building, with wide rooms, decorated walls with peasant paintings, marble floor in black and white geometrical paintings. I saw through words the details of the mansion. I got the video with the retrospective of William and Adriana´s lives, with many pictures, movie scenes and romantic characters from animated movies. The background knowledge of films was essential to recognize scenes and characters from: My Big Fat Greek Wedding, Notting Hill, Shark Slayer, Shrek, The Lady and the Tramp among others. The internet, endless source of information, helped me to discover other not so famous movies. I elaborated the script to the video, having in mind that I needed to save words. A short statement brings agility to the speech and follow the quick change of the pictures. Adriana, the beautiful bride, gave me some information about her gown made with silk mousseline fabric embroidered with silk grosgrain ribbons, swarovsky cristals, pearls, sequins and beads. She also gave the list of names of the bridesmaids and the best men with information about them. Finally, the big day came, December 17, 2010!!! 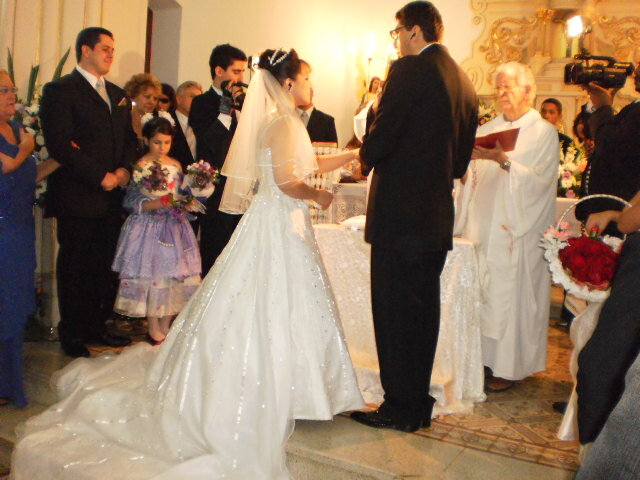 I arrived at the Chapel before enough to be able to conclude the script with information about the decoration, the beautiful clothes of the bridesmaids and their shine accessories, to take note of the guests´names who were arriving. What a joy to know who was there, the friend who came to attend the ceremony. It was really breathtaking to be able to describe the entrance of the groom in his strass bottom vest accompanied by his mother, best men and bridesmaids, flower girls and ring boy. The opening and closing of the door, the flutist and the clarinetist that came right before the bride´s triumphal entrance accompanied by her brother, the greetings and hugs. And being able to notice how people with visual impairment appreciated the audio description. They took part in a singular way, feeling all the emotion an event like this brings to us, only this time it was a well-informed emotion. Some testimonials about the first Brazilian wedding with audio description are at DEPOIMENTOS. I also leave here the links to check the articles wrote by Ricardo Melo, reporter from Movimento do Livre and from Ricardo Gleison from Portal Vanmix and the post on the Audio description Blog. Audio description in wedding cerimmonies? Why not? Written by Livia Motta – Fev 2011. Translated by Maristela Guimarães and Marcia Cabrera. I´m sincerely in love with all the possibilities AD brings to everybody in social events and in life. Thank you very much for bringing this wok and information to us. Many thanks, dear Magda! It will be a pleasure to receive your visit in one of the events with audio description. Taylor – Ari this is so beautiful, smpliy stunning. I showed a lot of people here at work and the consensus was, anyone that can make you get teary-eyed watching two people you don’t even know get married, is really good at what they do. Specially interesting and useful for those who are blind. Great idea!!! Thank you for your comment, Marisa.